Bail was set at $50,000 on Friday for the man who is accused of perching atop a downtown sequoia tree for nearly 25 hours. 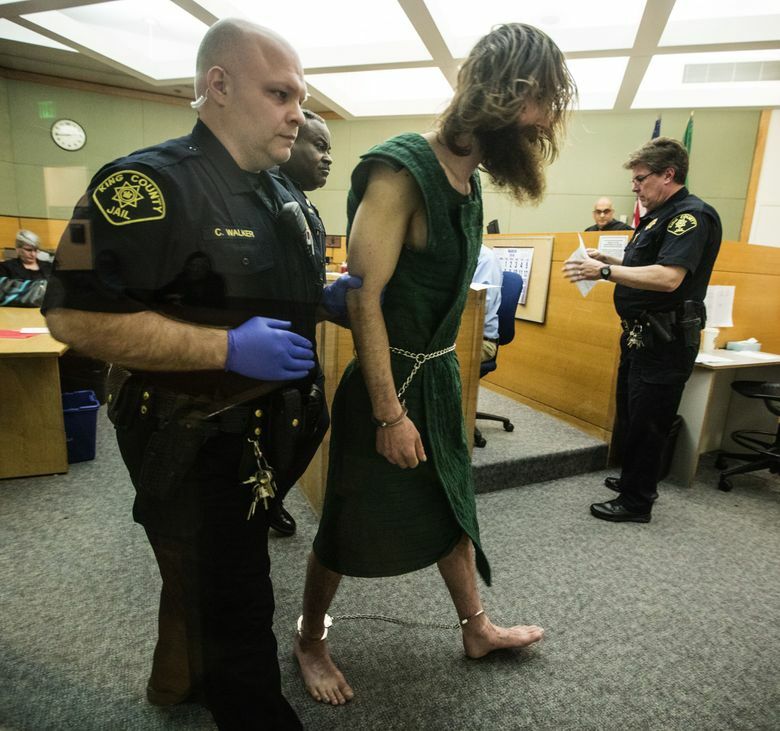 Cody Lee Miller said “Seattle police sent me to hell for climbing a tree” during his brief court appearance. He was originally scheduled to appear for a bail hearing on Thursday, but refused to leave his cell. Miller, 28, was arrested Wednesday after he climbed down from the tree outside the downtown Macy’s where he had spent the night in a makeshift nest of branches. Police and firefighters responded to Stewart Street and Third Avenue around 11:20 a.m. Tuesday after the man, later identified as Miller, threw an apple at someone and then climbed about 70 feet up the sequoia tree in a street median. From there, he threw green seed cones and branches he’d ripped from the tree, prosecutors alleged in the certificate of probable cause. The police also say he threatened to throw feces. Several passers-by and cars were hit by the cones, police said, and one officer suffered a cut on the ear from a “rock hard” cone, court documents say. Police said the man claimed to be carrying a knife. During the ensuing 25 hours, police said Miller ignored negotiators, and he drew a large crowd of onlookers. His antics earned him an Internet following as #ManInTree. Miller has also lived in Alaska and Oregon, where he has a criminal record. A spokeswoman with the Oregon Department of Corrections offender information center said Miller was sentenced to probation for two counts of assaulting an officer and a felony involving a weapon in 2013. Since then, he has violated the terms of his probation numerous times and was incarcerated from November 2014 to August 2015, she said.